ABSOLUTELY STUNNING! 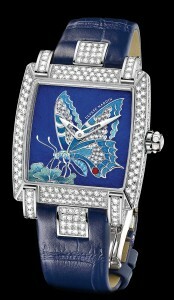 For the lady who has everything and just wants a luxury watch from one of the worlds finest watch manufacturers. This timepiece is an 18K white gold case,beautifull royal blue enamel dial,automatic movement, the finest quality diamonds are hand set on bezel and side of the case.